Each year, 15 million babies -- more than 1 in 10 -- are born prematurely. That means today, on World Prematurity Day 2015, more than 41,000 premature babies will be born. Many will grow up healthy, receiving the care that they need immediately after birth and in the days, weeks, and months to follow. They will be kept warm during their first hours, breastfed, and their heart rates monitored; they will be protected against infection; and they will be immunized against vaccine-preventable diseases. They will be on their way to leading healthy, happy lives. For many babies born prematurely, however, the picture is less joyful. Each year, nearly 1 million babies die from complications related to preterm birth -- the single largest cause of child mortality worldwide. This global figure masks deep inequalities both between and within countries. Sub-Saharan Africa and South Asia account for half the world's births, but more than 60% of the world's preterm babies and over 80% of the world's newborn deaths attributable to preterm birth complications. These are lives that we know how to save. A number of risk factors increase the likelihood of preterm delivery, many of which we know how to address. Adolescent pregnancy and short intervals between pregnancies can be prevented through healthier timing and spacing of births. Quality antenatal care helps ensure that mothers receive adequate nutrition during pregnancy. Integrated health services provide timely diagnosis and treatment of chronic illnesses and infectious diseases, such as malaria. Furthermore, these same services that help prevent preterm delivery also reduce the risk of low birthweight and stillbirth, and help ensure a healthy start to life. For those preterm births that cannot be prevented, we know interventions that save the lives of preterm and low birthweight newborns -- inexpensive and low-tech interventions that emphasize key behaviors. Kangaroo Mother Care (KMC) incorporates continuous skin-to-skin contact, breastfeeding, and close follow-up after discharge from a health facility. Inexpensive tools to clear newborns' airways and assist their first breaths prevent deaths due to birth asphyxia, and chlorhexidine applied to the umbilical cord after cutting reduces deaths due to infection by one-fourth. Premature babies are at an elevated risk of both birth asphyxia and infection, rendering these interventions of heightened importance. We have identified the most effective interventions; we have demonstrated their potential through proven strategies of implementation. Yet preterm babies continue to die at unacceptably high levels. If we are to achieve the vision of the Sustainable Development Goals adopted by the global community in September and end preventable child and maternal mortality within a generation, now is the time to act. This is an ambitious goal, but successes to date have demonstrated that the efforts of a unified global community are greater than the sum of its parts. Since 1990, the number of annual child deaths has fallen by more than half, and more than 100 million child deaths have been averted. Measles deaths have declined by over 75% since 2000 and now represent just 2% of under-five deaths globally. Since 2000, nearly 6 million children's deaths from malaria have been averted, thanks in part to the work of the President's Malaria Initiative. And the international partnership Gavi, the Vaccine Alliance, to which the US Government has been a major donor, has prevented an estimated 7 million child deaths since its launch in 2000. 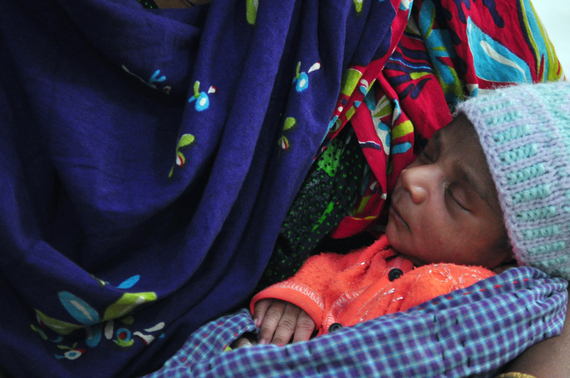 Now, newborn mortality has been recognized as a global health priority. Newborn mortality rates have fallen more slowly than rates of child mortality, and newborn deaths make up an increasingly large percentage of overall child deaths -- even as both figures continue to fall. With prematurity accounting for 35 percent of newborn and 15 percent of child deaths worldwide, preventing deaths from prematurity is more of an imperative than ever before. Today, the United States Agency of International Development (USAID)'s Every Preemie - SCALE project released its country profiles for 23 high-burden countries to provide data on the prevalence of risk factors for preterm birth and low birthweight. The figures are sobering. Three countries -- India, Pakistan, and Nigeria -- account for an estimated 5 million preterm births annually, one third of the global total, and half of the world's deaths due to preterm complications. Worldwide, momentum is building to dramatically reduce newborn deaths, as catalyzed by the Born Too Soon and The Global Alliance to Prevent Prematurity and Stillbirths (GAPPS) reports and the Every Newborn Action Plan. These and other initiatives, including Every Preemie - SCALE, the Healthy Newborn Network, Survive and Thrive, USAID's Maternal and Child Survival Program, and the forthcoming Public-Private Partnership to Prevent Preterm Birth, are aligning efforts to save lives across the globe using evidence-driven strategies and proven interventions. Today, as we stand poised to end preventable child and newborn deaths, we must recognize preterm birth as a priority within our global efforts. We have the experience and the expertise; we have the tools and the technology. Now, it is time for us to align our actions and global efforts -- and in doing so, demonstrate our conviction that every newborn is worth saving, no matter when, where, or how they are born.